Thousands of years ago, the Greeks worshipped the gods of Olympus, but their descendants live on in "Class of the Titans." The animated series features seven teenagers whose ancestors were some of the best-known mythological figures: Achilles, Artemis, Hercules, Jason (of "Jason and the Argonauts"), Narcissus, Odysseus (of "The Odyssey), and Theseus. Their scions are summoned to New Olympia on a mission to save the world from Cronus, who wants revenge after escaping from 4,000-years imprisonment. After Cronus learns of a prophecy, he frees the giants and unleashes the fearsome Typhoeus. Theresa, Odie and Archie arrive to find New Olympia hit with a power blackout. With the Earth about to stop turning, the gang tries to save Neil to fulfil the prophecy. The heroes travel to the Underworld in search of a special lyre to calm Cerberus. The demigod Pan plans to throw a party. After losing Hermes' powerful caduceus, Odie quits the team and joins Cronus. Jay tries to bait a trap for Cronus. After a bad moon rises on Halloween, Theresa and the gang learn that Hecate still has a few tricks. Neil can't stop bragging after capturing Medusa. Cronus obtains the bones of the original Minotaur and tricks a scientist into cloning the beast. Cronus locates Medelia,and awakens the magic within her to use against the Titans. Kampe, the jailer of Tartarus, attempts to forcefully use the Titans to recapture Cronus. 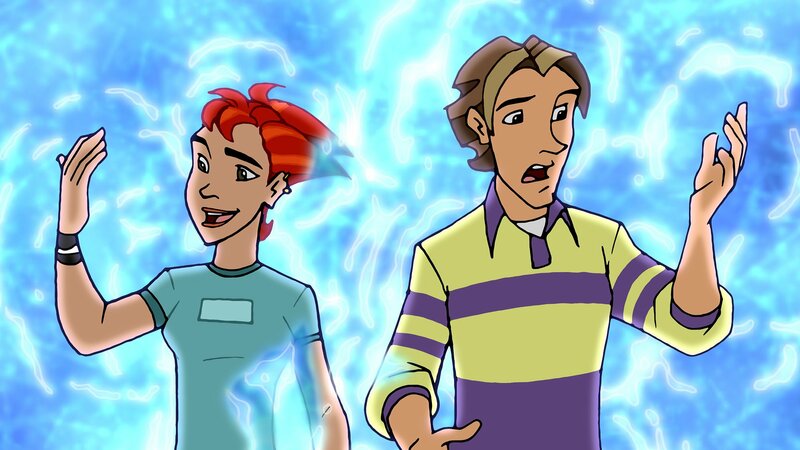 Archie opens Pandora's Box and releases Hope and a disease that was trapped with her. Arachne joins Cronus to regain her human form by hypnotizing Atlanta. Jay, Neil and Odie encounter a major storm resulting in them crashing on the island of Calypso. Cronus frees the Kraken from its imprisonment and chains Poseidon up on the beach. Cronus grants the cyclops Polyphemus back his eyesight, in exchange for trapping the Titans. Cronos kidnaps Eros and Psyche on Valentine's Day and forces Eros to spread hate. Poisoned by a Chimera, Jay has to literally fight Fate while the others find a cure. Cronus reanimates the bronze-giant Talos that was stored with Hephaestus' robots. Cronus sends Herry back in time to face a few of the Twelve Labors of Hercules. Cronus locates a magical grieve which he uses to turn army men into giant ants. Cronus unleashes the Stymphalian birds upon the Titans. Cronus reanimates a lamia queen named Sybaris, the first known vampire. Neil is kidnapped by Echo, who has regained physical form; Cronus kidnaps the other Titans. When Odie is slain by a Manticore, Jay finds a way to go back in time to prevent the death.